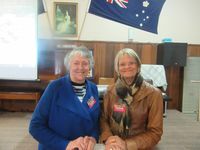 Vicky Keane, co-ordinator of Gardivalia Open Gardens, and Maree Wallace, secretary and publicity officer, gave a successful PowerPoint presentation today at Warragul Garden Club. The club is hosting the annual conference of South Gippsland Garden Clubs & Horticultural Societies. Each visitor received a Gardivalia booklet in their bag of goodies plus a list of accommodation venues. Together we spoke about Gardivalia’s 10 year history and how it has grown over the years, the types of gardens, the many and varied events, and our sponsors and collaborators. Many of the visitors are planning to visit our beautifully lush West Gippsland gardens open throughout October.